Welcome to part 3 of my Winter Fishing series, this time we are going to look at the subject of what equipment you need. I don’t mean rods and reels etc but let’s face it if you are not warm and comfortable then you are not going to operating at 100%. So keeping warm and dry is a priority, not only will you be happy and enjoy your time on the bank but you will be more motivated and efficient which can only increase your chances of landing that winter fish. 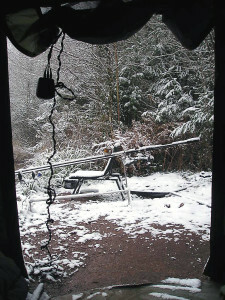 A snowy view from the Bivvy! So I am going to go over what I believe are the essential bits of kit for Winter Carp fishing. Let’s start off with shelter, now I prefer a bivvy over an umbrella style system but whatever you chose make sure it can stand up to the elements. A lot of people will advise a twin skin but I have had my Aqua M series bivvy for 7 years and have never used one with it and have never had an issue with condensation. It does have a heavy duty groundsheet which I think is essential to keep warmth in and damp out. I also like to have a piece of carpet with me to use as added insulation. I would highly recommend investing in a good quality sleeping bag (make sure it is rated as 5 season). I however have the Nash Sleep System 4 and it is the warmest thing I have ever used in fact I have not had reason to use both duvets! What I do use is an Aqua waterproof bedchair cover which keeps my sleep system dry especially after I have been out in the rain. These are available from a number of different manufactures and no matter what you sleep in you really need one of these. When it comes to clothing always layer up, multiple thin layers are far more efficient than two thick layers. I would suggest getting a purpose made base layer (I use the ones from Berghaus) as these will wick moisture away and stop extra chill. The other advantage of the layer system is that if you do find that you are too warm then it is really easy to remove a layer. Winter or Summer I will always have a hoodie with me as they are so versatile and just an all round great bit of kit. As for waterproofs I always go for ones manufactured by a specialist outdoor clothing company. I have used Berghaus since I joined the Army and it has never let me down and it always has to be Gore-Tex. Always have spare clothes with you in the car just in case.